New York City has the world's most recognized skyline. Its buildings soar upward, as if sprouting. 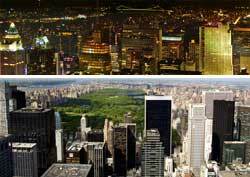 This occurs in two Manhattan clusters, midtown and downtown, with a "valley" of low buildings in between. True, the Empire State Building has higher observation floors. However, the Top of the Rock observation deck on the 69th floor of the GE Building in Rockefeller Center is clearly superior. Unlike on the Empire State Building, you are surrounded by famous landmark buildings, which enhances the vista. And, the view of Central park is fabulous (see bottom half of photo). It has two observatories. One is on the 86th floor, the other on the 102nd (currently closed for renovation). Wait lines can be exceptionally long during peak periods. Though the ride is pricey and brief, you get a true bird's eye view of Manhattan. You see the Statue of Liberty and Ellis Island, and the lower Manhattan skyscrapers as you sail across New York Harbor. And the ride is free! This casual East River esplanade in Brooklyn offers a fascinating view of the lower Manhattan skyscrapers.